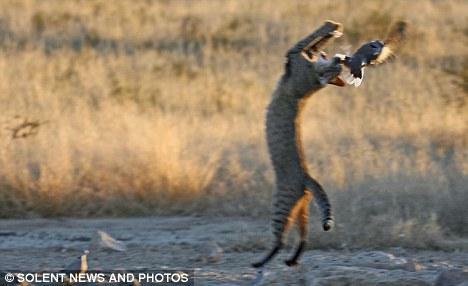 The African wildcat had already devoured two doves at the same spot when he returned in search of a third meal. He leapt more than 6ft through the air and demonstrated a perfect pirouette and backflip routine as he tried to grab one of the birds. But unfortunately for the cat his prey got away. The extraordinary performance was captured by photographer Jaycee Rousseau in the Kgalagadi Transfrontier Park, which straddles the border between South Africa and Botswana.